There seems to be no peace in sight in the ongoing battle between Justice Karnan and the Supreme Court. In the latest development, Justice CS Karnan has ‘issued’ a non-bailable warrant against seven judges of the Supreme Court. He has also directed the registrar-general of the Calcutta High Court to issue NBW through the DGP or Commissioner of Police, New Delhi. Justice Karnan issued this order apparently invoking his powers under Article 226 of the Constitution and Section 482 of CrPC and also "in the interest of the nation to protect the general public from corruption and unrest". In his order, Justice Karnan terms the SC judges “accused judges” and interestingly the name of Justice Banumathi is not seen featured, though it was included in his last ‘order’. A seven-judge Constitution Bench of Supreme Court headed by the Chief Justice of India on Monday had ordered the medical examination of Justice Karnan, who is facing contempt proceedings. Reacting to the SC order directing his medical examination, Justice Karnan had reportedly said he would not cooperate with it. 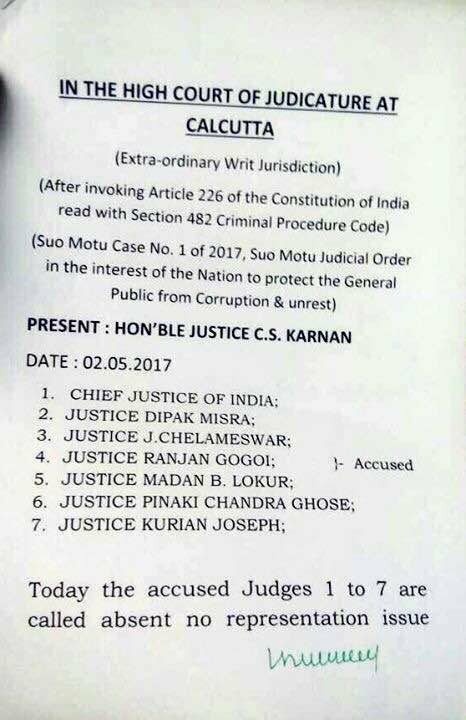 The bench had also seriously taken note of the two recent “judicial orders” passed by Justice Karnan (when he was restrained from issuing judicial or administrative orders) summoning the judges of seven-judge bench and directing the Air Control Authority not to allow the judges to travel abroad. The bench, in its order, had said: In order to ensure no court, tribunal or authority takes cognizance of orders passed by Justice Karnan, we restrain all courts’ tribunal authorities from acting on his orders. The SC bench had directed the medical board to submit its report on May 8, and Justice Karnan has posted his ‘suo motu case’ on the same day.